For anyone looking to dabble in regular and pitch-shifted ambience, this Shim's a win. Lots of control. Five types of reverb - all with applicable shimmer. Price. Far from the nicest shimmer reverb we've heard. If you've yet to experience the majesty of shimmer reverb, let us explain: the 'verb trail is pitch-shifted - usually up an octave - to create an ethereal haze behind your guitar, a little like a synth pad. 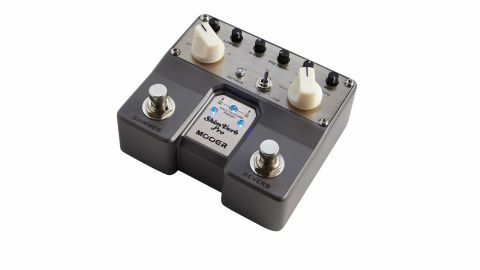 A variety of reverb pedals can do this, but Mooer's ShimVerb is one of the most affordable - and the Pro takes it to another level. Where the original ShimVerb featured only an unusual 5th-up shimmer, the Pro offers a choice of five intervals, which can be combined with octave-up shifting using a small button. "There are the requisite mammoth reflections, which are highly customisable thanks to the ShimVerb's handy low cut and hi cut controls"
The shimmer function is assignable to all five of the pedal's reverb types, activated using a separate footswitch, while holding both footswitches allows you to save a preset, too. Heading straight for the church 'verb, there are the requisite mammoth reflections, which are highly customisable thanks to the ShimVerb's handy low cut and hi cut controls. It's the shimmer we're here for, though, and while we weren't expecting Eventide levels of tracking, we didn't think it quite stacked up to shimmers from DigiTech or Zoom, either - to our ears, lower notes sounded a little out of tune. That said, the adjustable intervals are inspirational, while dropping the wet signal and cutting the highs keeps things from getting cheesy. If your guitar sound is based on shimmer, it's worth comparing it with the competition, but with its wide array of controls, the ShimVerb Pro covers all the reverb bases.